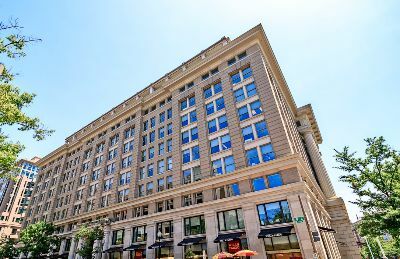 The Residences at Market Square is the name for a large mixed-used residential and commercial complex in the heart of Washington, DC. Built in 1990, there are two Neo-Classical buildings—each with a curvilinear design. These stately structures blend elements of traditional and modernist architecture, and have been widely celebrated not only for their look, but for their lap of luxury condos for sale. Located at 701 and 801 Pennsylvania Avenue, the complex is directly across from the J. Edgar Hoover FBI Building and the Department of Justice. The two buildings were built around the Navy Memorial, and sit atop the Archives-Navy Memorial-Penn Quarter Metro. That’s convenience! 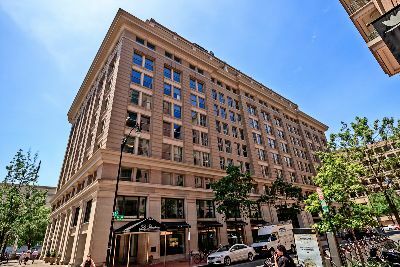 This particular neighborhood is known as the Penn Quarter, but it’s also associated with the larger Capitol Hill community in the 20004 zip code, and is right between the White House and the U.S. Capitol Building. The two buildings are known separately as Market Square East and West, and each contains 105 one and two-bedroom residences. There’s a wide variety of floor plans, ranging from 424 to 1250 square feet. Some units have dens as well. Condos for sale also run the gamut of prices, from the $400,000 range to well over a million dollars. Inside the Market Square condos you’ll find rosewood floors, massive windows and private balconies with some of the most amazing views in all of DC. The chef’s grade kitchens include granite countertops, cherry cabinets, Sub-Zero stainless steel appliances including slide-in ranges and convection ovens, plus Fisher Paykal dish drawers and wine coolers, all housed under the serving and prep bars. And then there’s all the other common amenities, like 24/7 staffed front desk and concierge service, security, secure parking, a state of the art fitness center and premiere roof decks and heated pools. Notice the plural, because each building has its own mirror amenities. Outside is a common plaza, and of course, the Navy Memorial itself-snuggled in right between the two wings. Market Square also includes about 670,000 square feet of office and retail space, so it’s conceivable that you could actually live, work and play in the same place. But when you do decide to venture out into the world, you’ll find a host of amazing galleries, museums, bars and fine restaurants, all within easy walking distance.